Cornell identified himself with Meaulnes as a ‘seeker of visions.’ Through his job as a traveling salesman by bike in Manhattan, he had the opportunity to see and observe. This was important to his work because it provided inspiration. He enjoyed it so much that even after his job ended, “his habit of wandering did not” (Blair 61). Everything artistic comes from some sort of inspiration we collect from the brain’s database of experiences. If it hasn’t been experienced, it is invisible. 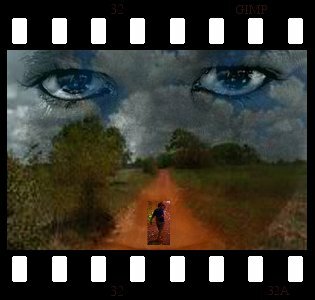 My blox for the quality visible captures a boy as he walks down a Kenyan road. My intention with this was for it to represent the path Njoroge takes to school. The small child on the road is actually a white boy though. I chose this to show how the white Europeans were the only truly privileged. Although Njoroge makes it further than any other boy from his village and surrounding areas, he does not make it as far as Stephen Howlands, the white boy from his area. There is a partially transparent image of a crying boy layered over the rest. The focus is on his eyes. The transparency has him looking out at us or looking into the photo. The land is slightly distorted. What we see depends on the eyes we see them through. I chose a film reel as a border in relation to Seger’s novel on adaptation. I feel that visibility is Calvino’s most significant quality when it comes to adapting a novel to film. Seger finds details and information to be an important aspect when adapting a piece. “Details in a novel build ideas, but they also give us information that is useful and often fascinating in itself” (Seger 21). Imagery translates well in adaptation because it applies to our senses. Seger gives an example from “Gone With the Wind” which describes a bloody scene of wounded soldiers during the Civil War. When described on paper, our minds automatically form the picture in our heads. We could have easily watched the same thing on film or looked at a picture depicting the scene. Seger’s insights help me to focus my adaptation. There are so many scenes within the novel that could be translated into picture form. Instead, I chose some images that seemed to represent the novel in its entirety. The goal of the blox was to translate my perception of the novel to others. I did that not only through carefully chosen images but through the use of colors, saturation, and brightness.